Current statistics regarding student debt are troubling. According to the National Center for Education Statistics, roughly 20 million people attended college in the U.S. in 2018, many of whom used financial aid to cover tuition, residence fees, and other academic costs. Millions of Americans hold outstanding college debt, and the Consumer Financial Protection Bureau estimates that together these borrowers carry roughly $1.4 trillion in outstanding student loan debt. Fortunately, many higher-learning institutions offer financial aid packages that include scholarships, grants, work-study programs, and other forms of assistance that students do not need to repay. These packages allow students to receive an education and pursue a successful career without accruing large amounts of loan debt. 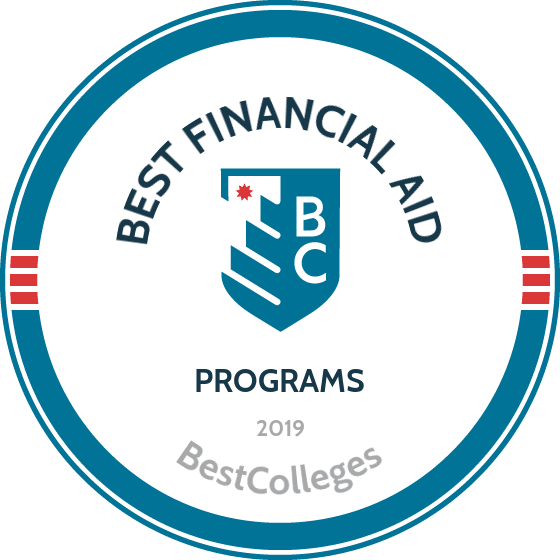 This list ranks the best U.S. colleges and universities in terms of financial aid packages that serve students whose family income falls below $48,000 per year. Our goal is to create a resource that students can use to determine which school best provides the assistance students need to receive an advanced education. UTPA offers a wide selection of scholarships that fall into four categories: endowments, institutional funds, grants and contracts, and state scholarships; students can also browse a list of links for private scholarships on the school's website. Students are welcome to apply online for these awards; the deadline for all scholarships is January 15. UTPA also maintains an extensive list of work-study opportunities (with contact information). Cal State Dominguez Hills offers four premier scholarships; the Presidential Scholarship covers full tuition for recipients, while the other three scholarships award between $2,000 and $4,000 per year. An additional 32 scholarships are exclusively available to Dominguez Hills students, and another eight scholarships are reserved for students attending any school within the CSU system. A list of more than 70 scholarships provided by private businesses and organizations (many of which are reserved for local residents, certain academic majors, or members of specific minority groups) is available on the CSUDH website. UNT offers two institutional grants, the merit-based Emerald Eagle Scholars award and the need-based UNT Tuition Grant; students who attend the university may also be eligible for three state grants. The UNT website also lists 19 scholarships, many of which are reserved for freshmen, transfer students, certain academic majors, veterans, and other specific groups. Students who demonstrate financial need may also apply for a work-study program; the maximum award for these programs is $4,000 per academic year. Cal State Los Angeles offers six department-specific scholarships, as well as 20 scholarships funded through private companies and organizations (most of which are reserved for California natives) and five Emeriti Fellowships. CSULA students are also eligible to receive Cal A or Cal B grants (both of which provide an annual stipend to students with demonstrated financial need). CUNY Lehman students with demonstrated financial need may qualify for the Tuition Assistance Program (TAP), a New York state-funded program for full-time learners. If financial aid from TAP is still insufficient, students may additionally apply for another state-funded tuition assistance program, City University Student Tuition Assistance (CUSTA). The university also offers two merit-based scholarships and two tax credits for students and their families. In addition to federal grants and the aforementioned TAP, students at CUNY John Jay may apply for the Academic Competitiveness Grant (which awards $2,000 during the first two years of undergraduate education) and the National Science and Mathematics Access to Retain Talent (SMART) Grant (which awards $4,000 for both the third and fourth years of study). A handful of scholarships are also available forundergraduate and graduate students enrolled at the university. The Louisiana Go Grant awards as much as $3,000 per year to students who demonstrate financial need. UL Lafayette students may also qualify for a Louisiana Tuition Opportunity for Students (TOPS) scholarship, which annually provides between $1,963 and $2,363 for recipients. The university also offers scholarships for institutional scholarships. Current students with a GPA of 3.0 or higher may also be eligible for the LSU Foundation Award, the amount of which will vary from year to year. In addition to 11 foundational scholarships and the Jeannette K. Watson Fellowship (a paid summer internship), Queens College students may also apply for New York State grant programs (such as TAP). Another option is the SEEK program, which is geared toward high school graduates who might not attend college without financial assistance. Students can also apply online for work-study programs facilitated by the university. CUNY Brooklyn offers two institutional grants: the Zicklin Summer Fellowship, which is reserved for sophomores, juniors, and seniors, and awards up to $2,500 per recipient (preference is given to veterans and disabled students); and the Petrie Emergency Grant, which awards up to $1,500 to students facing short-term financial constraints due to family illness, uninsured medical treatment, or other extenuating circumstances. The university also offers several scholarships, some of which are reserved for minority students, non-U.S. citizens, and top academic performers. Graduate students pursuing degrees in the fields of criminology, creative writing, or viticulture and enology may be eligible for fellowships that award full tuition for both years of their respective program. The university also awards more than 1,000 scholarships that collectively total more than $3.8 million dollars; individual awards vary from $100 to $35,000 (or full tuition), and are available for students at all levels. Northern Kentucky offers scholarship opportunities for incoming freshmen, transfer students, Native American enrollees, and students affiliated with the Army ROTC program. Additionally, the school lists nearly 60 scholarships made possible through foundational funds or donations from private companies and organizations; many are reserved for specific academic majors or members of minority groups. The university also offers three institutional grants: the Northern Difference, the Strive NKU Promise Program, and the Freshman/Sophomore Grant Program. UTEP Promise is a grant program that provides full tuition for all four years for undergraduates who demonstrate significant financial need (family income of $30,000 or less). The university also lists four merit-based institutional scholarships that award between $12,000 and $24,000 per recipient, as well as scholarships for valedictorians, graduate students, and non-U.S. students. CUNY Baruch College offers more than 100 merit- and need-based institutional scholarships for undergraduate students; roughly $1 million in financial aid is disbursed to more than 350 students each year. In addition, the school's website features an extensive collection of external scholarships and fellowships, as well as a list of scholarships and fellowships with deadlines in the following two months. CUNY City College offers 16 institutional scholarships, the majority of which are merit-based and reserved for specific academic majors; the floating deadline for most of these scholarships is March 15. Additionally, the CCNY New Era Scholarship is available for freshmen who scored in the 75th percentile on their SAT exam. Incoming and continuing students can apply for scholarships online. There are merit-based and need-based scholarships. More scholarship opportunities are available to international students, U.S. students who study abroad, first-generation collegiates from Florida, and graduate-level learners. Cal State Fullerton offers 11 departmental scholarships associated with student organizations and academic majors. In addition, 39 institutional scholarships are available to enrolled students regardless of their field of study; many are reserved for students who demonstrate financial need and/or belong to certain minority groups. The university's website features a timetable of important financial aid deadlines. Introduced for the 2014-15 year, the California Middle Class Scholarship is designed to provide tuition assistance to students whose family income is too high to qualify for federal grants, but still too low to finance an accredited degree program without outside support. Cal State San Bernardino students can apply for additional scholarships and fellowships using the school's online financial aid portal. In addition to the federal and state-sponsored financial aid opportunities available at all branches of CUNY, enrolled students are welcome to apply for more than 100 private and governmental scholarships honored at Hunter College. The school's website also lists five college study programs with financial stipends and a guide to grants and loans specifically geared toward international students. Incoming CUNY Staten Island students are encouraged to submit an online scholarship application; depending on background and current financial status, an applicant may qualify for a merit- or need-based institutional scholarship or grant. In addition, all CUNY students may apply for merit-based 'prestigious' scholarships and fellowships; the Staten Island branch also offers 13 scholarships reserved for students with disabilities. LSU more than 100 merit- and need-based departmental scholarships (the majority of which are reserved for students majoring in either business or agriculture) and institutional scholarships. Current students with a GPA of 3.0 or higher may also be eligible for the LSU Foundation Award, the amount of which will vary from year to year. Under the IU Pell Promise Award program, Indiana University will pay the remaining tuition of any enrolled student who has received a federal Pell Grant and maintained a GPA of 3.0 or higher. State-sponsored financial aid options available to Indiana residents who enroll at four-year universities include the O'Bannon Grant, 21st Century Scholars Program, and Child of Veterans and Public Safety Officers (CVO) Supplemental Grants. Although the 2014-15 listing has not been released, Marshall University has historically made need- and merit-based available to the entire student body, as well as awards specifically reserved for incoming freshmen, student athletes, top academic performers, and other niche groups. On- and off-campus work-study opportunities are posted on the university's website. In addition to need-based and merit-based grants available to all North Carolina residents, students who are enrolled at Appalachian State may also qualify for some of the 20 institutional and foundational scholarships offered through the university. Students who do not qualify for federal work-study programs are urged to visit Appalachian State's online Student Employment portal. The scholarships offered at Louisiana Tech are divided into three categories: admissions, departmental, and private (external). In addition to the TOPS Program, Louisiana Go Grant, and other state-sponsored aid options, disabled students may qualify for financial assistance through the Louisiana Vocational Rehabilitation Services grant program. Texas A&M has partnered with more than 100 Texas high schools to create the Century Scholars Program, which awards $20,000 to freshmen applicants who have excelled in academics or extracurricular activities. Other institutional financial aid programs available at the university include the Greater Texas Foundation Aggie Scholars Program and the Terry Foundation Scholarship. In addition to nine institutional grants available to any students enrolled in the UNC system, North Carolina State offers scholarships for incoming freshmen, transfer students, international students, and graduate-level learners. Students interested in on- or off-campus work study employment should contact the university's Career Development Center. For 13 consecutive years, Kiplinger's Finance has named UNC Chapel Hill as the "best value in public education." The university's need-based James M. Johnston scholarships are reserved for freshmen from low-income families with exemplary grades and/or SAT scores. The university's renewable merit-based scholarships include the Old Well and Founders Scholarship ($3,000 per year) and College Fellows Scholarships ($2,500 per year). Twenty specific academic departments at the University of Michigan award scholarships to students currently earning degrees in those respective fields. Michigan residents are also invited to apply for state-sponsored aid opportunities, such as the Michigan Competitive Scholarship or the Tuition Incentive Program (TIP). Non-federal work study programs are listed on the university's online student employment portal. Georgia Tech's 'gift aid' options include 12 merit-based scholarships and 126 department- specific awards (most of which are reserved for upperclassmen with exemplary academic records). The Georgia Tech Fund (maintained with support from the university's alumni association and industrial partners) provides financial support for a handful of students that demonstrate financial need. UVA students may qualify for Virginia Commonwealth Grants, which award up to $3,000 to each recipient per year (preference is given to Pell Grant recipients). Students who hail from Washington, D.C. (a significant contingent of the UVA student body) may also be eligible for the D.C. Tuition Assistance Program, which pays the difference between in- and out-of-state tuition (up to $10,000 per year). A full listing of institutional scholarships is available online. West Virginia's scholarship offerings include awards reserved for freshmen, transfer students, members of certain minority groups, leadership students, and specific academic majors. In addition to federal and state-sponsored grants, the WVU HERF Grant is available to any West Virginia resident or non-resident enrolled at the university with demonstrated financial need. Undergraduate and graduate-level scholarships available to SDSU students are listed online; web users must enter their grade level and major field of study to generate a list of all scholarships for which they are eligible. As a member of the California State University system, SDSU students may also receive State University Grant (SUG) support for up to 150 credit units. The Tennessee State Assistance Award (TSAA) and Tennessee Lottery Scholarship are two state-level programs that provide tuition assistance for established residents who demonstrate financial need; Middle Tennessee also honors the D.C. Tuition Assistance Program. The university also offers an extensive list of need- and merit-based scholarship opportunities. Cal Poly Pomona students who submit a Bronco Scholarship Application will be considered for more than 300 need- and merit-based scholarships offered through the university. Additionally, California residents enrolled at least half-time in a state university undergraduate program may qualify for tuition assistance from a Cal Grant. Students belonging to certain minority groups can apply for scholarships available through the university's Office of Student Life and Culture. The University of Texas at Brownsville's extensive scholarship list includes 23 general scholarships, more than 90 department-specific awards, and further aid opportunities for graduate students, athletes, and other niche groups. North Carolina A&T offers 28 endowment scholarships (most of which are need-based), merit-based awards through seven academic departments, and eight scholarships specifically reserved for current or veteran military service members. Additionally, the university's National Alumni Association Scholarship covers all tuition and fees for a handful of applicants with stellar academic records; a GPA of 3.0, SAT score in the 75th percentile, and/or ACT score of 22 or higher is required. More than 700 financial aid awards are included in the CSU Long Beach scholarship directory; incoming freshmen, undergraduates, and graduate students can perform a customized search (using their grade level and major field of study) to determine the scholarships for which they are eligible. In addition to other state-sponsored grants, the renewable Chafee Grant awards $5,000 per year to each recipient that maintains good academic standing. The Florida Bright Futures program is a four-tiered award system that provides between $103 and $44 per credit hour for each recipient. The university also sponsors two renewable institutional grants for students with "exceptional financial need": the I. Douglas Turner Grant (which provides up to $5,000 per year) and the UF Graduate Grant (which provides up to $2,000 per year). Students who submit an online scholarship application will be considered for the more than 50 merit- and need-based scholarships offered at CSU San Marcos every semester. In addition, the Equal Opportunity Grant is reserved for students who demonstrate exceptional financial need. Those who do not qualify for federal work study should seek out university-sponsored work study opportunities at the Career Center. Undergraduate scholarship offerings at UW's Seattle campus include five departmental awards, the Washington NASA Space Grant, and the Diversity Scholar Award (which awards up to $40,000 for four years of tuition per recipient). Graduate students may apply for financial assistance through grant awards and work study programs. Texas A&M - Kingsville offers tuition assistance for prospective accountants with the Fifth-Year Accounting Student Grant, which provides up to $3,000 for recipients (financial need is required). Undergraduate and Graduate Tuition Grants (both of which supply up to $2,000 per year for recipients), as well as athletic and departmental scholarships, are also available. UT Dallas offers more than 80 institutional scholarships, many of which are department-specific or geared toward students with financial need. Veterans who attend the university may also qualify for tuition assistance under the Hazelwood Exemption Act, which provides support for up to 150 credit hours for military veterans from Texas. The University of Wyoming provides four different scholarships (each of which provides $750 per semester) that are funded through sales of the university's proprietary license plates. First-time students from Wyoming are encouraged to apply for the Hathaway Scholarship, Trustees' Scholar Award, and other financial aid options exclusively available to state residents. The Purdue Opportunities Program (funded by alumni and university donors) awards financial assistance to first-time students who are Indiana residents and whose families earn an annual income of $50,000 or less. Ten of the university's academic departments award merit-based scholarships to students who are pursuing degrees in those respective fields of study. The Southeastern Honor Scholarship awards up to $6,000 in tuition and housing assistance for incoming freshmen at SLU; the amount of award will vary on the applicant's combined high school GPA and ACT scores. Another institutional award, the Progression Scholarship, provides up to $500 for sophomores, juniors, and seniors who are on track to graduate within four years. Seven academic departments at UNC Wilmington offer merit-based scholarships for students who are pursuing degrees in those respective fields. The university's SOAR Program is reserved for students whose family's income is "less than 200% of the federal poverty level"; the program covers remaining costs of tuition and associated fees not provided by federal aid sources. The South Carolina Need-Based Grant targets state residents who wish to attend Clemson (and other SC schools) and demonstrate financial need; the grant will provide up to $2,500 per recipient. Scholarships at Clemson are divided into four categories: academic recruiting (reserved for incoming freshmen), diversity, restricted (non-renewable), and department- specific. Buffalo State's Bridge the Gap program involves a lottery of all students who demonstrate financial need; no application is required, and winners will be notified after each drawing. The university also offers merit-based scholarships, endowment awards, and financial aid options for international students. WSU awards more than $90 million in financial aid and scholarship awards to its student body every year. Utah residents who attend the university may qualify for three renewable state-sponsored grants that award anywhere from $400 to $3,050 per recipient each year. WSU also offers scholarship opportunities for out-of-state students, incoming freshmen, and international students. Three institutional grants ― Enhancement, Undergraduate, and Graduate Grants ― are available to students who enroll at UWF; these award up to $2,000 per academic year for each recipient. Students who are admitted to UWF are automatically considered for all applicable scholarships and grants offered through the university; information from their application is used to determine eligibility for each award. Financial aid consists of public and private dollars that help fund students' higher education. Colleges with the best financial aid offer online school grants and help students apply for federal and state aid packages. By choosing colleges that give the most merit aid, students can avoid excessive loans, which can affect future income. When selecting an aid offer, borrowers must understand the differences among loans, grants, scholarships, and loan forgiveness programs to help minimize high interest rates and establish repayment plans. Most scholarships are competitive and merit-based, meaning they go to students who meet the criteria established by those who govern the scholarship. Students can apply for and receive multiple scholarships, and they do not need to pay back the money. Prospective students should search online scholarship databases to find scholarships for which they can apply. Church groups, corporations, civic clubs, and community philanthropists often set up scholarships, and guidance counselors can point applicants in the right direction. Grants serve as a form financial aid typically awarded based on factors such as financial need or identity. Most grants go to students whose income or assets fall below an established baseline. Students can receive multiple grants from different sources, including private funds, state grants, and federal aid programs. Like scholarships, students do not need to repay grants. The most well-known grants come from the U.S. government. By filling out the FAFSA, students automatically apply for most of these grants. Veterans, military personnel, teachers, and healthcare workers should look for grants specific to them. Students who receive federal work-study dollars receive U.S. government money for performing an approved job. Many schools provide institutional work-study jobs in which the college or university pays students out of institutional funds. To receive a federal work-study grant, applicants must demonstrate financial need by applying for the Federal Application for Student Aid (FAFSA). Other institutions set their own guidelines for institutional aid. Most work-study jobs occur on campus, although some take place off campus in instances where schools boast agreements with local agencies. Work study pays federal minimum wage or more, and colleges and universities cap the number of work-study hours a student can complete. Loans provide students with immediate funds to pay costs related to higher education. Loan recipients must pay back the amount they receive in full, with interest. The federal government offers four types of direct loans: subsidized, unsubsidized, PLUS loans for parents, and consolidation loans. Each includes distinct benefits and limitations. State agencies and nonprofits also offer fixed-rate student loans to qualifying students. Private agencies such as banks and credit unions also offer loans, but unlike federal or state loans, these often come with high interest rates and strict repayment schedules. Colleges and universities provide direct aid to their students in the form of scholarships, grants, and work-study programs. Institutional aid programs receive funding from the college itself and from private donors. Applicants should ask the university's financial aid office about institutional scholarships and other aid. Federal student aid includes Pell Grants, student loans, federal work-study programs, and aid to military members and veterans. Parents can also apply for PLUS loans, and students in majors such as education and healthcare can apply for loan forgiveness. To get started, applicants need to complete the FAFSA. Each state provides school financial aid such as grants, loans, and loan forgiveness programs. Most make eligibility for these financial aid programs contingent upon holding legal residency in their state. Prospective students can contact their state's department of education or commission on higher education to learn more. Private entities provide scholarships, grants, and fellowships to qualifying applicants. Most of these financial aid options are merit-based, but some are based on financial status. Prospective students can start searching for aid by using online databases of private scholarships and grants. The FAFSA is the most important financial aid application form a student can complete. Many schools and private organizations require students to complete the FAFSA to receive consideration for institutional aid or private scholarships. Any student who plans to seek federal or state assistance must complete the application. FAFSA applications typically open on October 1 and close on June 1. Prospective students should complete their FAFSA as close to October 1 as possible in order to improve their chances of qualifying for grants, scholarships, and work-study opportunities. Prospective students can access this guide to help them through the FAFSA process. Many colleges and high schools also offer assistance with the FAFSA. The Department of Education (ED) offers several types of federal grants. In order to qualify for these funds, students must first complete the FAFSA. Then, they work with their schools to determine how much money they qualify for. Students at career schools, community colleges, and four-year universities can qualify for grants. Except for the TEACH grant, the grants listed below go to students who demonstrate financial need. Pell grants go to students who demonstrate financial need, who do not hold a bachelor's degree, and who are not incarcerated. Students seeking a post-bachelor's teaching certificate may apply. The U.S. government awards FSEOG grants to students who demonstrate financial need. Recipients may not hold a bachelor's degree. TEACH grants go to recipients who meet financial qualifications, enroll in a participating program, maintain academic standards, and agree to serve as teachers in high-need fields for at least four years after graduation. This grant goes to college and career students who do not qualify for Pell grants and whose parent or guardian died as a result of military service in Afghanistan or Iraq after 9/11. Most state education agencies offer grants and other student aid programs. The amount of these awards, the financial eligibility requirements, and any additional parameters vary by state. Typically, only residents of the state qualify. To explore grants and other financial aid opportunities by state, students can access the National Association of Student Financial Aid Administrators website. Subsidized and Unsubsidized Loans: What's the Difference? The U.S. government organizes its financial aid loans according to subsidized and unsubsidized loans. A subsidized loan refers to loan in which the federal government pays the interest either while the student attends school or the loan is in deferment. The borrower pays for the loan's principal and any accrued interest. An unsubsidized loan refers to a loan in which the student pays the interest that accrues on the loan from the loan's inception. Students who fill out the FAFSA apply for both kinds of loans. Typically, a subsidized loan serves as a much better choice for students. During repayment, borrowers can pay off a subsidized loan faster and save more money than those who pay off both kinds of loans simultaneously. Private loans help students bridge the gap between other forms of financial aid and the costs associated with higher education. While the U.S. government caps federal loans at a standard number and limits interest rates to about 8%, private loans can go as high as the lender wants, and interest rates can exceed 25%. Federal loans also employ various deferment options for graduates who struggle to make payments, while private loans do not. In fact, some private lenders advertise a low rate for students in school, but in the fine print, lenders show the interest rate will soar once a student leaves college. Due to their high costs, private loans should only serve as a final option. In general, students who rely on grants, scholarships, work study, and federal loans leave school with far less debt than those who rely on private loans. Only a student's school can calculate the cost of the individual's financial need, but the formula for determining those costs is the same from institution to institution. It begins with expected family contribution (EFC), an index number based on the family's income, assets, and benefits such as social security. Schools determine this number by the information provided on a student's FAFSA. The EFC does not indicate how much money a student's parents will actually pay for college, it only calculates how much need-based financial aid a student qualifies for. Schools subtract the EFC from the cost of attendance (COA), a number determined by adding together tuition, fees, room and board, and other expenses. By deriving the difference between the COA and the EFC, schools determine the amount of aid a student may receive. The tables below show how to calculate financial need and non-need-based aid using COA and EFC. Example: "If your COA is $16,000 and EFC is 12,000, your financial need is $4,000, and you do not qualify for more than $4,000 in need-based aid." Example: "If your COA is $16,000 and you've been awarded a total of $4,000 in need-based aid and private scholarships, you can get up to $12,000 in non-need-based aid." Scholarships provide private funding to help deserving students meet the financial requirements of higher education. Most scholarships are competitive and merit-based, and students should maximize their chances of receiving an award by applying to multiple scholarships. Each application includes individual requirements, and applicants must follow instructions. Individual philanthropists and corporate entities establish foundations to support students in their communities. A search through an online database uncovers many of these. Churches, synagogues, denominations, and other faith communities provide financial aid through grants and scholarships to members pursuing higher education in theology and other disciplines. Many professional associations offer competitive, merit-based scholarships for undergraduate and graduate students in order to foster excellence in their fields. This online searchable scholarship database lists over 8,000 financial aid awards and employs a variety of search terms and filters. This resource provides a scholarship database searchable by major and student demographic. Readers also find helpful articles on how scholarships work. FAFSA: This application comes from the ED and determines how much federal student aid a student qualifies for. Some merit-based scholarships require it as well. Transcripts: Applicants need to submit high school transcripts if applying to undergraduate programs and postsecondary transcripts if applying to a graduate degree. Essay: Essays demonstrate a prospective student's ability to organize thoughts, compose a logical structure, and write according to the rules of English grammar and convention. Letters of Recommendation: Usually written by teachers or employers, letters of reference answer specific questions about a student's ability to learn at the appropriate level and provide information about character and personality. Documentation of College Enrollment: Ask for a proof of enrollment statement from your college registrar, which should show your name, social security number, course list, and enrollment status. Make a checklist and go through it carefully as you prepare the application packet. Check off each component as you put it in the packet and again before sending it off to ensure that you complete the total application. Scholarship committee members want to know about you. They want to understand your hopes, ambitions, skills, and talents. Committees tend to overlook applications that include generic content applicable to almost any student. Before submitting your application, proofread everything. Wait at least 24 hours between composition and proofreading to increase your odds of catching an error. Even better, ask an English teacher, colleague, or friend with an eye for grammar to proofread your application. Scholarships typically come with deadlines. Make sure to submit your application a few days before the deadline to avoid last-minute delays that result in denial. Over 60% of today's college students rely on loans to fund their education, but there are plenty of overlooked financing options you can use to reduce your overall student debt. Completing the FAFSA is a crucial first step for any student with financial needs. Our FAFSA guide features a step-by-step rundown of the process and answers frequently asked questions. Online college programs serve as a flexible, affordable option for single parents interested in earning a degree and securing their family's financial future. This is a list of scholarships, grants, and other financial aid options geared toward single parents. All 50 entries on this list are four-year public universities with enrollments that exceed 10,000 students. Furthermore, each school participates in the federal financial aid program known as Title IV. Federal financial aid under Title IV includes the following programs. Unlike student loans, none of these financial awards require repayment after the student has graduated. Pell Grant: A grant that provides tuition assistance to students who demonstrate financial need. The current maximum amount allowed by a Pell Grant is $5,730 per year. TEACH Grant: A grant that provides up to $4,000 per year for students earning a degree related to education. Recipients must commit to working in a "high-need field" or at a school that primarily serves low-income children and their families. Federal Work Study (FWS): These programs allow students to be employed in positions related to their academic major at a rate no lower than the state-mandated minimum wage. Average Net Price (ANP): This figure represents the sum total of educational costs for students whose annual family income falls below $48,000. ANP is calculated by subtracting the amount of money obtained through financial aid that does not need to be paid back (i.e, scholarships and grants) from the 'tuition sticker price'. Overall Average Net Price: Unlike the previous figure, this ANP applies to all students regardless of their family's household income. Since students with higher family income will not be eligible for certain forms of financial aid (such as federal Pell Grants), this amount will be higher than the ANP for students with a family income under $48,000. Both sets of data were obtained from the Integrated Postsecondary Education Data System (IPEDS), an online compendium managed by the National Center for Education Statistics (NCES).